Multi Unit Controller (MR) : An auxiliary control device that can control up to 12 units of Hitachi compressors. This allows energy saving as it stops the compressors progressively when production air requirement reduces. It starts up the compressors progressively when air demand increases. Easy operation setting through the dialog type interface. 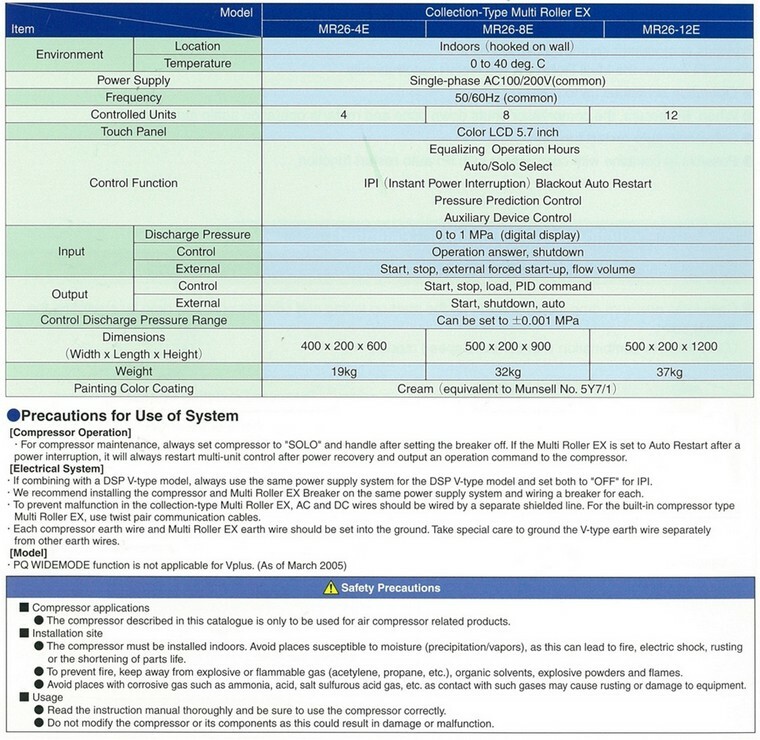 It is possible to set the weekly schedule operations of multiple units of compressors. In case of changing to 2nd pressure setting, the operation pressure is automatically changed, enabling better saving of energy. Compared with the conventional parallel operation (suction throttle control), significant energy-saving is achieved by the multi-unit control system of Multi Roller EX. Even higher energy-saving can be achieved by combination of Vplus compressor. When the minimum pressure drop is predicted, compressor restart will be triggered earlier so as to prevent further pressure drop. Control of up to 12 separately placed air dryers and up to 2 cooling water pumps is possible.